As a teenager, I never liked attending family gatherings. In fact, I DREADED my time there, especially during the Chinese New Year gatherings. Having suffered from acne since I was 14, I was often the talk of the town whenever I was in the same space with my relatives. There’s just something about them that wouldn’t stop commenting on my pock-marked face. Being a sensitive girl, every single comment I received about my acne-piqued skin would kill me inside and bruise my self-confidence. I became apprehensive about leaving the house and indulged in lots of thick foundation to try to cover all my blemishes, but to my horror, made them worse. The makeup on my skin then became another talking point for my relatives because I was then chided for wearing makeup and making my acne worse. Truth be told, those days were like living hell and I desperately needed a cure. Trust me, I’ve tried many “solutions” in the market, including topical acne treatments, laying off heaty food like chocolate, chips and fried food, Oratane (a.k.a. Isotretinoin, a medication primarily used to treat severe acne), medi-facials (medical facials for acne) and more but none of them worked. Fast forward 10 years now, I’m still suffering from hormonal acne and ugly post-acne scars until I met Dr. Gerard Ee from The Clifford Clinic. WARNING: REPULSIVE IMAGES AHEAD BUT WORTH LOOKING FOR IT WILL CHANGE YOUR LIFE! Life has never been better because I can finally look at the mirror looking confident with my bare face! That was something I could NEVER have achieved, despite trying all sorts of methods for 10 years. The treatments that were introduced to me by Dr. Ee were the AGNES Treatment, followed by the Q-Switch Laser Treatment. 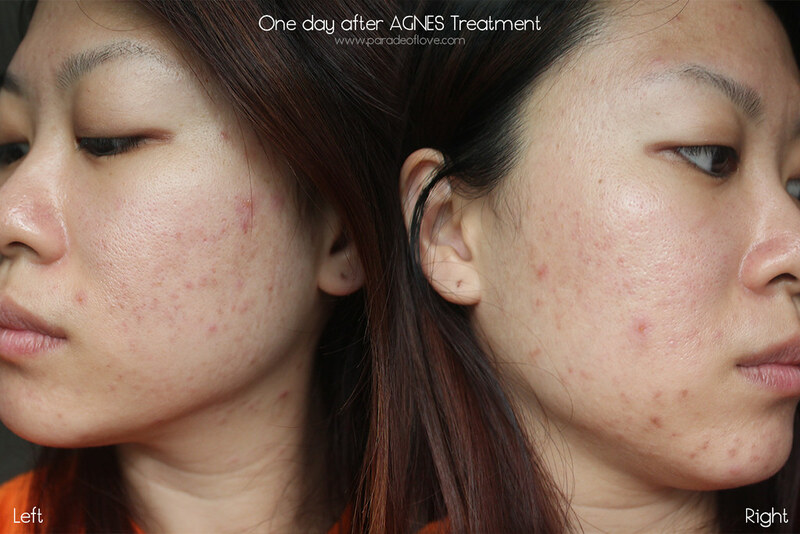 The AGNES Treatment works to target acne prone follicles and hyperactive sebaceous glands on the face, which essentially tackles the root problem of acne. I have overactive oil glands, especially on my jawline and chin areas, resulting in recurring acne, which contributed to my deep acne scars over time. 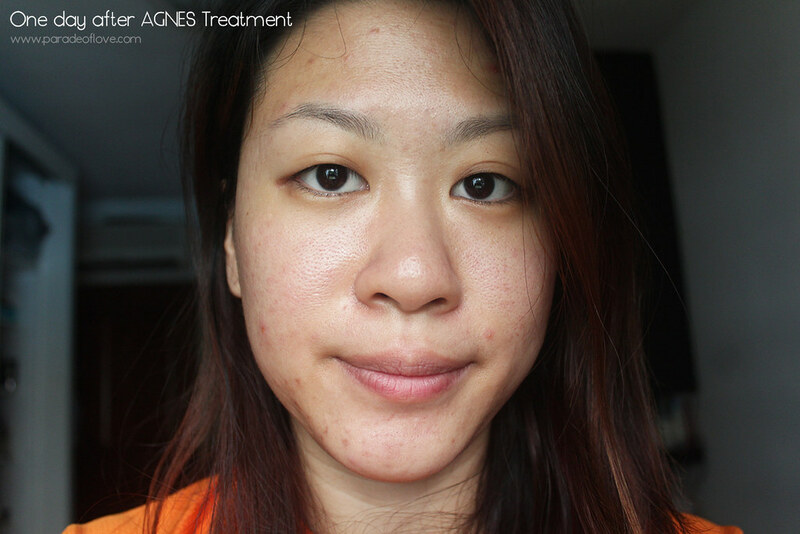 To be frank, I was very sceptical of the AGNES treatment at first because I’ve tried so many solutions and remedies that failed to work on my skin. I gave up all hopes to achieve a clear complexion and didn’t think this would change anything. 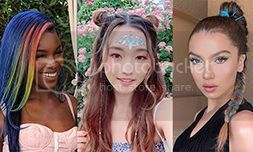 However, I was proven wrong since 25 June 2018, the start of my acne treatment journey with The Clifford Clinic. 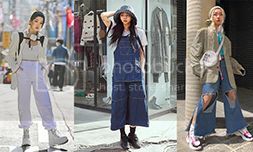 So what is the AGNES treatment about? From here, I will document my experience with the AGNES treatment to give you an insight of what it’s all about, my thoughts on it and the results from it. As mentioned, the AGNES treatment, in a nutshell, is a treatment that “kills” your hyperactive sebaceous glands on your face. Before the treatment, one of the therapists at the clinic first applied a numbing cream, then performed an extraction on my skin to get rid of dirt, pus and clogs. Then, Dr. Ee used a magnifier to have a close-up look on my skin to locate the blocked pores. After which, with a very fine wire attached to the AGNES machine, a tiny electrical current or radiofrequency energy is delivered with precision through micro-needles on the areas that he had identified. 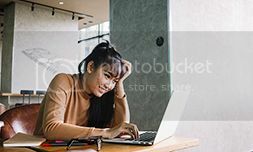 What this does is to destroy those nasty sebaceous glands that cause recurring acne, and this results in the gland’s size being reduced, thus with less oil produced. With lesser or almost no oil, there will not be any blockage which can lead to inflamed and clogged pores. As a result, no pimples or acne will be formed! This was one of the most painful treatments I’ve ever done to be honest, but looking at my complexion now, I must say that it’s the most worthwhile pain to endure. I would rate the pain level 8/10. Anyway, the treatment only took about 10-15 minutes and I looked like I had some skin disease or something, but the redness and flare ups subsided a fair bit after a good night’s rest. The next day, I had to return to the clinic for a post-treatment drainage and a Radio Frequency treatment. I was also given only 4 skincare products to adhere to – a moisturiser (Clifford Cream), a gel facial cleanser (Clifford Cleanser), a cream called Epiduo for daytime application and Stieva cream for night-time. Ever since the AGNES treatment, I’ve been feeling the best version of myself. I used to suffer from hormonal acne but not anymore. 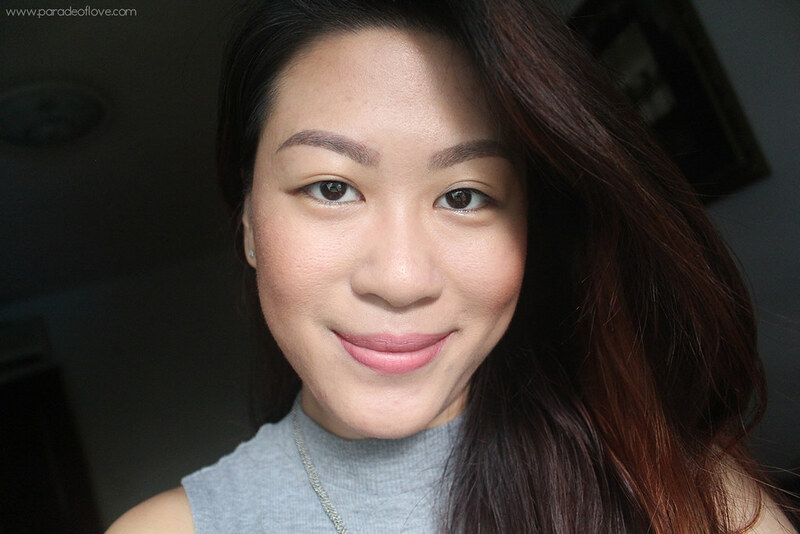 I used to also battle with post-acne scars every month but since the treatment, I’ve been all smiles every month! I do get a pimple or two time and again but it’s no longer angry flare-ups anymore. Though the AGNES treatment did provide a long-time cure for acne for my skin, I do feel that my skin is dry, especially in an air-conditioned environment so ample hydration and moisturisation is super important for me. 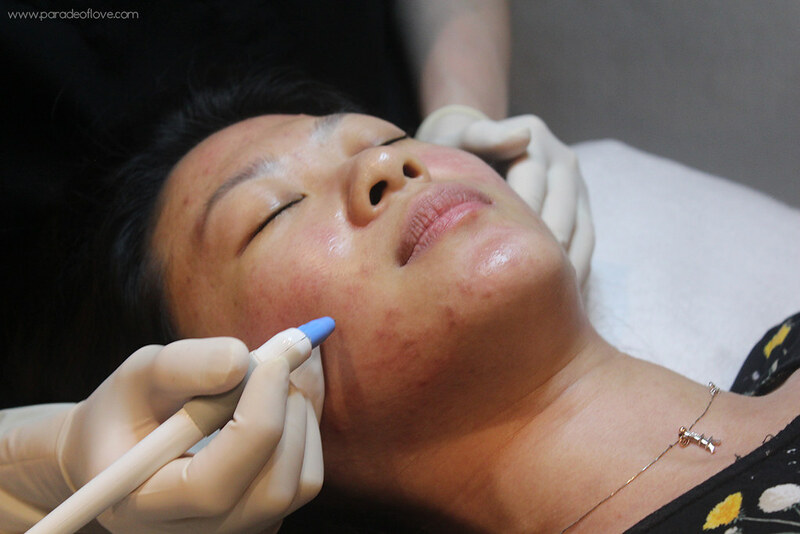 To complement the AGNES treatment and journey towards a better complexion, I was also recommended the Q-Switch Laser Treatment to remove the hyper-pigmentation due to acne. I’ve been heading back to The Clifford Clinic every 2 weeks now for the Q-Switch Laser treatment and it’s been the most fuss-free treatment! Termed as a lunchtime treatment, the Q-Switch Laser has no downtime, which makes it easy for anyone to do it and return to your normal daily activity. 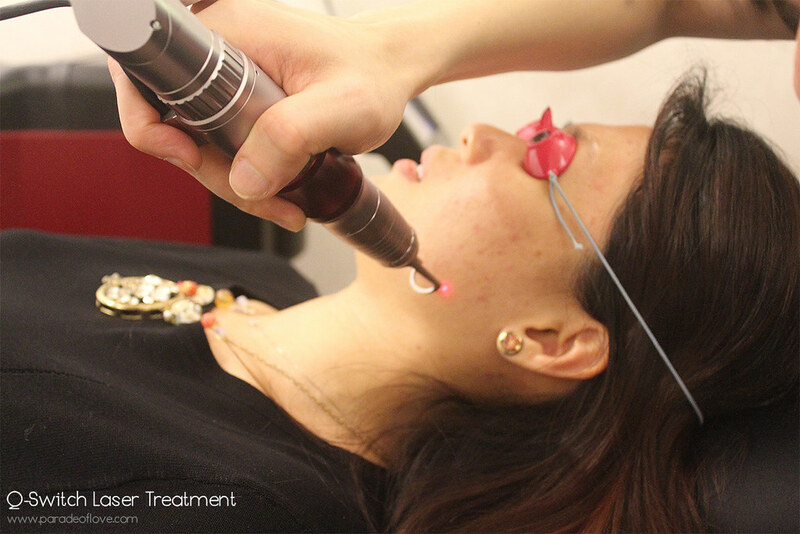 What the laser does it to target marks on the affected areas through a non-invasive high-energy laser pulse at a specific wavelength. The scar pigments are then broken down in smaller fragments to be absorbed by the skin, before being naturally cleared away by the body. 5 treatments now, I can drastically see a difference on my skin. I used to not be able to leave the house without makeup, but now? I can confidently run errands on my bare skin and if I wanted to attend an event, just a light coverage foundation would suffice. Although I would say that I’m still a few steps behind achieving flawless skin, I’ve never been happier looking at myself in the mirror, bare faced. I would definitely keep you guys updated as I continue my journey towards ideal skin! Although I would say that I’m still a few steps behind achieving flawless skin, I’ve never been happier looking at myself in the mirror, bare faced. I would definitely keep you guys updated as I continue my journey towards ideal skin! Create yourself & be gorgeous!